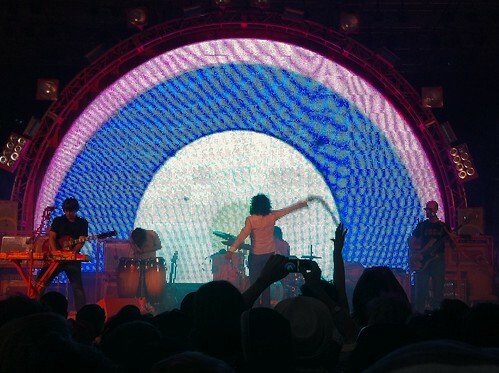 Its hard to believe that its been almost four years since The Flaming Lips have performed within the borders of NYC. That September 2006 concert at Hammerstein Ballroom had Deerhoof as the opening band, and featured much of the then-new At War with the Mystics album. While Monday night’s show at Summerstage featured a new band member and new material from 2009’s Embryonic, many of the same stage props and antics remain from years past. But the band’s willingness to dedicate themselves to providing an incredible night of entertainment night in and night out is what continues to make this band’s live show perhaps the most enjoyable of all similar bands touring today. And while Wayne does tend to speechify, its abundantly clear that the man’s heart is in the right place. The band’s setlist is the same as the other shows on this tour, but the wonderful night weather gave an added celebratory air to this show that made it special. I recorded this set with my best mobile unit from literally within the first fifteen feet of the crowd — great for atmosphere, but not so good for avoiding much crowd participation. I was so close as to literally be underneath Wayne’s bubble during “Fear”. The listener should understand that this recording was captured from a prime experience location at this show. With that caveat, enjoy! 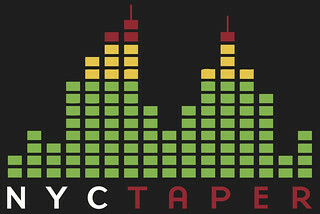 If you email nyctaper for access to this recording, we expect that you will PLEASE SUPPORT Flaming Lips, visit their website, and purchase their official releases from the Store at their site [HERE]. Any chance Oneida’s set was recorded? It was not. We arrived too late and WAY too many people chatting down where we were. Their opening track is not “Enthusiasm For Life Defeats Existential Fear”. That’s a completely different song. The opening jam is usually given a different name specific to the event (at least when theyve uploaded live recordings in the past). Just call it Intro or whatever you want. I was at the March Oneida show and it was indeed amazing–no doubt the best Oneida show I’ve seen. Awesome capture acidJack. Thank you and nyctaper for all your efforts!! Any chance you guys know where I can find a recording for the Terminal 5 show?? Beautiful recording. Great job as always. Any chance you’re planning to be at the Dean Wareham show at the Bowery Ballroom on 8/19? How hard was it getting your gear in? Did you run a stand? Thanks! We didn’t run a stand. Generally we haven’t had problems getting gear into venues because we are recording bands that allow taping. Of course, if they don’t inform the venue in advance, it can be an issue. With Summerstage, if the band informs security, it’s fine. If not, it may be hard to locate someone to go to bat for you.